Heroin Addiction and Related Clinical Problems publishes Editorials, Regular Articles, Short Reviews, Reviews, Preliminary Communications, Short Communications, Reports, Expert Opinions, Case Reports, Letters to the Editor on subjects regarding heroin addiction and related clinical problems. Heroin Addiction and Related Clinical Problems is particularly interested in therapies, including all aspects of translation from bench to bedside: identification of novel therapeutic targets, epidemiology, clinical trials, drug safety and meta-analyses. Reviews should include systematic revision of the literature concerning the topics treated and meta-analyses. Short reviews are dedicated to particular aspects of heroin addiction. 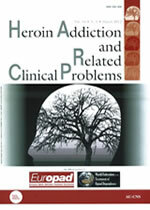 Heroin Addiction and Related Clinical Problems accepts for publication only unpublished data. The structured abstract must not exceed 250 words. Authors should submit manuscripts including figures to the Heroin Addiction and Related Clinical Problems website using exclusively the downloadable form - Papers must be submitted exclusively to the Journal, and are accepted on the understanding that they have not been, and will not be, published elsewhere. The submission process requires a full declaration of the personal interests of all Authors, and funding interests by the presenting author; these details should also be included in the text of the manuscript. By submitting your manuscript to the journal you accept that your manuscript may be screened for plagiarism. Copyright Transfer Agreement: Heroin Addiction and Related Clinical Problems Authors will NOT be required to sign a Copyright declaration. The Editors retain the usual right to modify the style and length of a contribution (major changes being agreed with the corresponding Author) and to decide the time of publication. The manuscript should be typed (with a 3 cm margin) and double-spaced. Authors should retain one copy of all material, as the Editors cannot accept responsibility for loss of, or damage to, a manuscript. A title page should contain the Authors’ full names, appointments and place of work at the relevant time, plus the full contact details of the Corresponding Author, including his/her current e-mail address. A full title should be given, together with at least 3 key words for indexing purposes. The text should start with a structured Abstract, not exceeding 250 words, organized into sections using all of the following headings: Background, Aim, Materials and Methods, Results, Conclusions. The paper should then proceed conventionally: Introduction, Materials and Methods, Results, Discussion, Conclusions, Acknowledgements, Contributors, Role of funding source, Conflict of interest and References. Pages should be numbered consecutively in Arabic numerals, but tables, footnotes, figure legends, Acknowledgements, Contributors, Role of funding source and Declaration of interests must also be submitted on separate sheets. Review Articles should include a structured summary using all of the following headings: Background, Aim, Materials and Methods (e.g. search terms used), Results (avoid vague statements e.g. ‘…will be discussed’), Conclusions (e.g. need for future studies). Reporting Clinical Trials Conducted by Pharmaceutical Companies: Please ensure that clinical trials sponsored by pharmaceutical companies follow the Declaration of Helsinki. For production purposes, you must supply every figure in A4 pdf format (minimum 300 dpi). Figure and table legends must be able to stand alone in the text and thus full descriptive legends for all figures and tables should be supplied. Methods should be referenced. Two-tailed significance tests should be used unless explicitly stated otherwise. Controls should be described as completely as experimental subjects. Measures of location should be accompanied by measures of variability (e.g. mean and confidence intervals) as well as conventional probability values. Clinical trial reports should include the power of the study design. An Ethics Committee should have approved human and animal studies but in questionable matters the Editors reserve the right to reject papers. Sources of financial support during the last two years must be acknowledged. Please read the following statements, adding those sections which are relevant at the end of your submitted manuscript under a heading ‘Statement of Interests’. 1. Authors’ declaration of personal interests: (i) [Name of individual] has served as a speaker, a consultant and an advisory board member for [names of organizations], and has received research funding from [names of organization]. (ii) [Name of individual] is an employee of [name of organization]. (iii) [Name of individual] owns stocks and shares in [name of organization]. (iv) [Name of individual] owns patent [patent identification and brief description]. 2. Declaration of funding interests: (i) This study was funded [in part or in full] by [insert name of funding organization], grant number [insert grant or other identification number]. (ii) The [writing or preparation] of this paper was funded in part by [insert name of funding organization]. (iii) Initial data analyses were undertaken by [name of individuals if not listed as Authors] who are employees of [name company] and received funding from [insert name of funding organization]. (iv) Writing support was provided by [insert name of individual(s)] of [name company] and funded by [insert name of funding organization]. References must be ordered by authors’ names alphabetically. Start each reference with bibliography number; use these numbers, in squared parentheses, for in-text citations. Personal communications, unpublished manuscripts, manuscripts submitted but not yet accepted, and similar unpublished items should not appear in the reference list. Such citations may be noted in the text. Maremmani A. G. I., Rovai L., Maremmani I. (2012): Heroin addicts' psychopathological subtypes. Correlations with the natural history of illness. Heroin Addict Relat Clin Probl. 14(1): 11-22. Tagliamonte A., Maremmani I. (1995): Drug Addiction and Related Clinical Problems. Springer-Verlag, Wien, New York. Dole V. P. (1995): Methadone Maintenance. Comes of Age. In: Tagliamonte A., Maremmani I. (Eds. ): Drug Addiction and Related Clinical Problems. Springer-Verlag, Wien New York. pp. 45-49. Journal names should be abbreviated as they appear in Index Medicus, journals not currently indexed there should not be abbreviated. The EndNotes© output file is downloadable at Heroin_Addiction.ens. Generic names should, in general, be used. If an Author so desires, brand names may be inserted in parentheses. Drug names are spelled out according to the European Pharmacopoeia, but the American spelling should be used after the first use of a drug name. The corresponding Author will receive an e-mail with a PDF file (portable document format) of the proof. Acrobat Reader will be required to read the file. Excessive changes made by the Author in the proofs, excluding typesetting errors, will be charged separately. Heroin Addiction and Related Clinical Problems combines the characteristics of a fee-based and no-fee open-access journal (see cost of publication). Heroin Addiction and Related Clinical Problems is a scholarly journal that is available online to the reader without financial, legal, or technical barriers other than those inseparable from gaining access to the internet itself. Editorial coordination, editing and the printing of a limited number of pages is a subsidized activity, whereas the printing of additional pages requires payment by the author (see: cost of publication). Subsidized activities are financed on a voluntary basis and by educational grants from the Association for the Application of Neuroscientific Knowledge to Social Aims (AU-CNS), a not-for profit agency located in Pietrasanta, Lucca, Italy (www.aucns.org); those requiring additional costs are typically financed by money made available to researchers for that purpose by a public or private funding agency, as part of a research grant. AUCNS was founded in Viareggio (Lucca) in 1994. It is as a not-for-profit association aiming to promote the spread of scientific knowledge and its application to issues of mental illness and substance abuse. AUCNS is involved in research and teaching activities, and the organization of seminars, conferences and public debates with either scientific or popular audience targets. Among these, the most remarkable are the National Conference of Addictive Diseases, which is held in Italy every two years, The European Opiate Addiction Treatment Association (Europad) Conference, which is held in various European towns every two years, and a Europad satellite meeting within the American Opioid Treatment Association Conference (AATOD) in the USA, which is held once every 18 months. AUCNS directly cooperates with national and international associations on the basis of common purposes and fields of interests, and runs an editing activity comprising psychiatry and substance abuse textbooks. Donations can be made to: Support Europad Activities. You can contact the Editor in Chief, Icro Maremmani, MD (maremman@med.unipi.it) . Our team will be able to provide advice and quotations for journal supplements. The articles (black and white printing up to eight pages in length – 30,000 character spaces included) are published without charge. Please consider 1 figure or 1 table as half a page. Authors will be charged € 40.00 for each additional page. Contributions written by Researchers from developing countries are subject to special conditions/benefits.